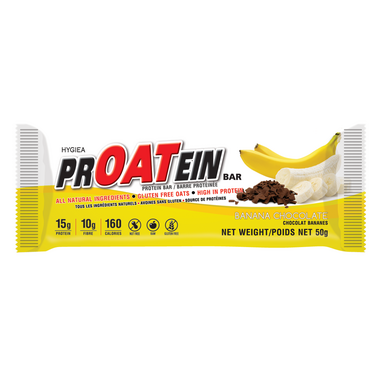 Enjoy the classic combo of Banana and Chocolate with PrOATein's Banana Chocolate Protein Bar. This all natural bar is made with real Cocoa and Banana and will satisfy that sweet tooth of yours! Ingredients: Chicory root fiber, Gluten free rolled oat, Whey protein isolate, whole grain brown rice, protein concentrate, whey protein crisp (whey protein isolate, whey protein concentrate, tapioca starch, calcium carbonate, soy lecithin), date paste, moisturelok (grape juice, rich dextrin), water, sunflower oil, dutch processed cocoa, banana flake, organic semi-sweet chocolate (organic cane sugar, organic unsweetened chocolate, organic cocoa butter, organic vanilla flavor), tapioca syrup, natural flavor. As someone who cannot eat nuts due to an allergy, I've been searching for a long time for a protein bar that I can eat. I finally found these bars and they taste delicious! I'm a huge fan of chocolate and banana, and this combination is great!